This is not your ordinary blog hop. This is a blog hop that will ultimately bring a bit of beauty and happiness to over a hundred family members. The rules of the hop -- make a bracelet in an adult size in blue. The bracelets will be sent to The Global Genes Project, an advocacy group for children's rare disease awareness. The Global Genes Project then sends the bracelets to one of 7000 families having children with rare diseases to show them love and support. When I started making this bracelet, my little boy, Zack, wanted to help, so we raided my blue gemstone drawer together. Zack had definite opinions about what DID look good and what didn't -- I truly believe I have a jewelry designer in the making. Zack and I decided to use chunky rounds of faceted sodalite and charms of larimar. Larimar is a rare gemstone mined only in the Dominican Republic, and I love it, love it, love it. I like how we covered the range of blue from light to dark, and I got to make my favorite style of bracelet. Anything with charms makes me happy! Zach does have a good eye.. Your bracelet is beautiful. Love your bracelet, your son has good taste! Thank you for organising the bloghop and for such a deserving cause. Love seeing all the different blues too...amazing! Thanks for the shout out about this campaign sweetie...not only for a good cause, but it's also helping me get the bug back again! double whammy! those blues are wonderful together ! Thank Lori for taking time to organize this hop.You are my first stop.I'm off and ...hopping ! Just love the beautiful charm style bracelet you created, I know it will make someone very happy. You and Zack make a great pair! what a lovely bracelet. I like how you incorporated the rare Larimar in the design that represents the rare diseases..lovely!! Thanks again for the offer, it was a pleasure to participate. What a wonderful team you make! Beautiful bracelet! Wow! What a beautiful and precious bracelet. I absolutely love the larimar with the sodalite. Thanks for calling us to action for this great cause. Beautiful bracelet Lori!! Thank you so much for organizing the Hop! I have to agree with Stefanie, it was so much fun and an honor to participate! Thank you! Love the larimar! Such a beautiful, rich blue. Thanks again for hosting this event. It was fun and rewarding. Have a great weekend! Wonderful to see so many participants for this great cause! I missed the hop with you but I will send in my bracelet. Thanks for posting the address. Wow Lori! Isn't it cool to see the creative juices flowing from your child? Ya'll made a lovely bracelet, and I know it will be a blessing. Thanks so much for hosting this hop. It was truly an honor to participate. So nice that Zack helped you! I love larimar. Your design is beautiful and will make someone very happy. Thank you again for doing this... it feels good to pray for and do something for someone struggling. We all need each other! Oh I think it was so awesome of you to let us all know about it and it was my pleasure to be part of it. I love that Zach helped and he is such a doll! We all know where he gets his generous heart and that bracelet is awesome! Way to go Team Anderson! Your bracelet is gorgeous. I hope you are having a fantastic day and feeling good. i love that your son enjoys helping you. i'm so happy to see so many people participated, i wasn't able to do the blog hop but thanks for including the address so we might donate toward global genes project. You and your son created a gorgeous bracelet. Thanks for organizing such a special blog hop. Thank you for organizing this blog hop, Lori! I agree your bracelet is very cool! Love the stones! Feels good to give. Glad I could be a part of it! Thanks again! I love Larimar too - my parents brought me a pendant back from Dominican Republic when they went to visit friends from the old country who immigrated there at the same time my parents immigrated to the States. Thank you for organizing this wonderful event! You and Zach made a beautiful bracelet. It will have such a special meaning for whoever the recipient is. Thanks again for doing this. Absolutely gorgeous! And I agree, your son is definitely a designer in the making! I love the bracelet Lori -- thank you so much for coordinating this wonderful event -- it was an honor to participate!! WOW Zack! You did your momma proud helping her pick just the right elements for this beautiful bracelet! Thanks for letting me join in on this wonderful project Lori. Zack definitely has learned great taste from you. Love the stones, all of them!! Very pretty bracelet. Tell Zack he has a good eye for design. What a handsome young man he is! I love your bracelet. I think I love anything with larimar in it! I've made two bracelets that I'll be sending in. I just don't have the blog. I'm getting closer. Zack is adorable and I love that he's getting into design. Go Zack!! Another Beauty Lori!! I love that Zach helped on this one, what a wonderful kid! Love the bracelet, Zack did a great job. Thanks again Lori for inviting me to participate. Beautiful Lori! I love larimar myself! Someone is sure going to enjoy this! Thank you Lori - for bringing this to our attention. All that you do is amazing - you really do inspire me. Your bracelet is gorgeous! Love the two different blues together! Pretty combination! Your son hase a great eye. Happy Saturday hop! Lori, your bracelet is lovely! I love those faceted sodalite rounds! Thank you so much for organizing this hop. I am so thrilled to support the Global Genes Project! Beautiful! Larimar is my favorite, I think it is so beautiful! looks great! Thanks for doing this Lori, I had thought about it & hadn't followed through. You were the spark to get me going. 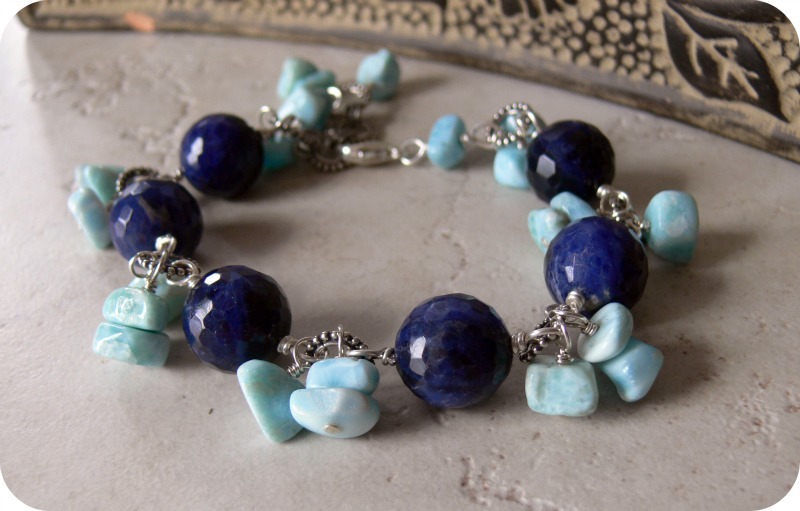 Lori, I love your bracelet with the chunky sodalite and charms of larimar! Charm bracelets are so feminine and so much fun to wear! You guys make a great design team. This is my first time to participate in a blog hop and it has been so much fun! Thank you for being such a kind soul and bringing us together for this campaign. Beautiful bracelet, Zack and Lori! It's perfect and whoever receives it will be one happy lady! Okay, how adorable is your son? I think your bracelet turned out wonderfully! I'm totally loving larimar - I've never had a chance to play with it, but the color is superb! I LOVE that your son helped you! Beautiful bracelet! 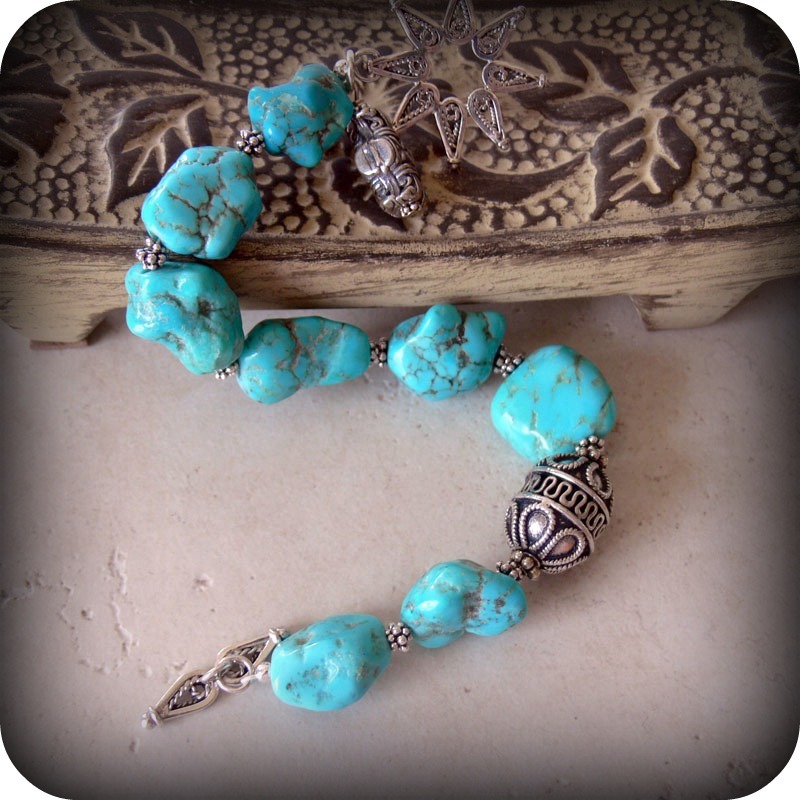 Love the larimar beads too! I LOVE the aqua color of the larimar with the dark blue faceted beads! Your son has a good eye. Mine used to love to bead jewelry, but now that he is 9, he has moved on to more "boy" like things. I love it when the little ones get into the creating with us :) Lovely bracelet - Larimar is one of my favorites too! Love the bracelet Lori and you and Zack make a wonderful team! Go Zack and Lori design team! :-) You two make a great pair! Lori, your bracelet is beautiful and I especially love those chunky faceted soladite rounds...just love faceted beads! I am from your new blog club book! Can't wait to read over your blog and start communicating! I am in love with your bracelet...and your choice of gemstones you picked with your son's assistance are just right! What a stunning, CHARMING BRACELET and what a wonderful person you are. Hey Lori, what fun! The bracelet that you and Zack designed is just fabulous! and what a face! so sweet and cute! Great job on putting this together ... hope you are enjoying your weekend. Beautiful Bracelet my Friend & THANK YOU for the opportunity to get involved in such a worthy cause!! beautiful bracelet! thanx so much for putting this together and giving us all the opportunity to create, look around, and give a little something. Thanks for always being so special and give us so amazing opportunities. I love yours, Lori. Now why didn't I think of something so unusual? Oh I know, I didn't Zach to assist me. lol. Thanks for organizing the hop. I know it's a LOT of work. Thanks a lot for making this happen! I am honored to be part of this and to be able to contribute to the good cause! beautiful! Looks like lots of us used sodalite...I love it :) Thanks for hosting again and for opening our eyes to this project! What a fantastic cause and so helpful to have all the blogs posted this way. As someone who has only just started making jewellery its brilliant. Not only do I get to see some inspiring and very beautiful jewellery it makes it so easy to find all the jewellers in the crafting community. Your son sounds just like my daughter. She loves getting the beading board out. Thanks for sharing. Beautiful bracelet! !Thanks so much or organizing this. You and Zack knocked it out of the park with this one -- it's gorgeous! And anything made with such love and good energy will bring great comfort to the recipient...And I'm dizzy from all the eye candy in the hop. Thanks for organizing the fun! LOL I have been so busy blog hopping and commenting that I never got past the list to comment on your bracelet. It is lovely. Glad you had help- that is always fun. Thank you for your work in making this happen. Thank you so much, Lori, for bringing us all together for this important cause. It was a wonderful way to do something good and meet some talented artists. Your bracelet turned out so beautiful Lori! And Zack helped to make it!! ... I think that makes it even more special. I'm sure it will be loved! Thank you so much for organizing this for all of us! I am so happy to have taken part in it! Lori, thank you for hosting this blog hop. and I wanted to tell you, I love you bracelet! 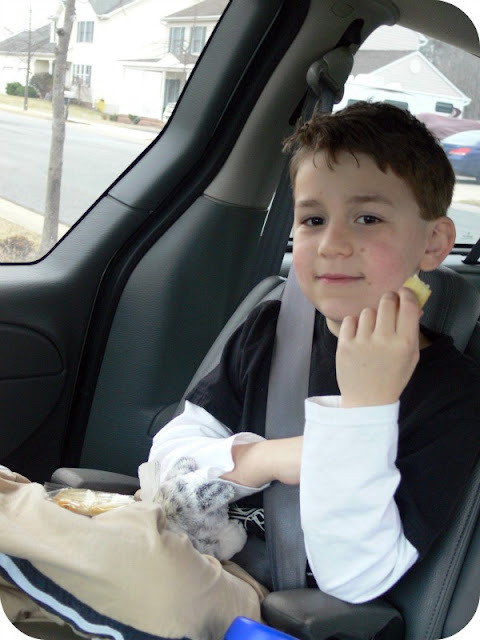 Love that faceted sodalite and how sweet your boy wanted to help! Grateful for the opportunity to be part of this, thank you! I adore larimar..it's on my wishlist! Thanks again for hosting such a wonderful cause! Lori, Your bracelet is so beautiful. You and your son did good. I love larimar also! Thanks for starting this blog hop, I'm proud to be a part of it. Love your blue bracelet!!! You and Zach work well together. I agree with you, danglies sure made for a great bracelet. What a wonderful bracelet. Thanks for hosting this wonderful hop. What a beautiful bracelet! Love that your son got to help. i love your style and the way you put things together!! the dangles on this bracelet are so much fun! thanks for hosting this hop for such a great cause. What a wonderful bracelet! How nice to have your son participating as well... This blog hoping is fun... I just have a few left! what a lovely bracelet! It will be a lot of fun to go blog hopping again...so here goes! You have the greatest blog events...love 'em! I think this is a great initiative! I feel kind of ashamed I haven't participated. Being in the medical research "business", I know how low priority the rare disease have - which is very sad, because no matter how many others have the same disease or not, the impact in a person's life is still the same. Thank you Lori for organizing this great campaign. Love your bracelet. I am so pleased that so many jewlery artists are part of this. I have loved doing this. Gorgeous bracelet Lori! Thank you for once again being host. I hope you are feeling better! Your bracelet is just beautiful! I know I would love wearing it. I'm sure the recipient will enjoy it, too! I finally got mine posted, it has been a busy weekend in the road with a teenage daughter! School activities....and springtime is just as busy as the rest of the year. Thanks for getting this project together; otherwise, I would have never known about it. Enjoyed participating! Have a great week! Everyone is so talented - the bracelets are all gorgeous. You have done a wonderful job of organizing this as well as making a fabulous bracelet Lori. I know the recipients will be thrilled. A beautiful bracelet Lori! Zack is a great partner and has a wonderful eye for design just like his mother! Being the mom of a child with a rare illness...this means so much to me! Thanks for all the work you put into this and allowing me to participate!! He's definitely inherited his mother's design sense. Gorgeous bracelet, thanks for organizing it. Sorry about being so late! I am glad to know that your son helped you with the bracelet for a noble cause. I missed the hop but would send a bracelet to the address you have mentioned in the post. Thanks again for connecting amateur beaders like me with these noble cause. You have done another wonderful thing. This is such a good cause! And so many signed up. If things are calmer next week, I will make one and send it in. Just taking it a day at a time. I'm really sorry I am late to the blog hop! But I'm starting to make my way round the blogs. Your creation is amazing, as always Lori! Zack clearly has inherited your eye for picking good colour combinations. beautiful bracelet Lori - whoever receives this will love it I'm sure. And what a talented boy you have! Of course. I've just posted mine, two days late but I got there in the end! Blue jean is my favorite! And ur braceleis sooo cute with the light blue nuggets! I know you're not feeling well, but I do have to say thank you for sponsoring this blog hop that will in the end brighten others' days. Your bracelet is gorgeous, I wouldn't have expected anything less. Here's hoping you get to feeling better soon. Please don't push yourself to hard. Lori, First of all, I pray that you feel better soon. Thank you so much for organizing this wonderful thing. I did not know about it earlier, but better late than never. So I am going to send my bracelet soon and you can see it in my blog. I am so glad you involved Zach in this process. How sweet. Beautiful bracelet too. What a wonderful cause to throw your support behind. I think you all are wonderful warriors to show us all we can pass it on! I made it! I started with the last name in the list and worked my way up to #1. It's just been amazing to see so much creativity, generosity and love. Lori, you and Zach did an awesome job on your bracelet. Thank you so much for organizing this. You are right for stating that this will not be an ordinary blog hop. You ultimately did an extraordinary large bracelet. It has a royalty design. I made a bracelet for this awhile back, I wish I'd known about this blog hop as I would have loved to participate, but I always find out about these things too late due to my inability to keep up with anything lol. This is a great cause! !